Dewey, the Elf on the Shelf of HPLD, has arrived once again this year. You can follow along on our Facebook page or stop to see the mischief and mayhem he causes in the library during the month of December as he helps Santa Claus with the selection of books and movies to place in children’s stockings. During the day he looks like a doll and can’t be touched, but at night when the library closes he and his friends have fun times reading, playing, and watching movies in the library. At your next holiday gathering, please consider saving Coca-Cola product bottle caps for the Heyworth Public Library. We turn these into free prizes for our reading programs. We have redeemed them for MP3 audio players, mini chess sets, and digital bookmarks to be used as prizes for our summer and winter reading programs. We collect caps all year long. It’s a great way to support your local library! Offers free downloadable e-books and audiobooks through Overdrive and Axis 360-Download the free apps today. Nov. 20 – Dec.11 The Community Angel Tree has arrived to benefit local families in need. Stop in the library to get your angel today to make a difference in a child’s life this season. Nov. 21 – Dec. 14 Great Bedtime Story Pajama Drive, Heyworth 3rd Grade Girl Scout Troop is collecting new pajamas in all sizes from newborn to adult for children in need. New pajamas can be dropped off at each of the Heyworth Schools or the Heyworth Public Library. Dec. 4 After School Movies, 3:20 p.m. Every Friday the library is open. Bring a friend and your own snack! All drinks need to have a screw on cap – no juice pouches or cans please. Dec. 11 LIHEAP, 1 pm – 4 pm. Low Income Home Energy Assistance Program (LIHEAP) Outreach will be available on Friday, December 11. LIHEAP representatives will assist anyone that would like to apply for this assistance from 1 p.m. through 4 p.m. Any questions regarding this program can be asked through Mid Central Community Action at 309-829-0691. Dec. 15 Lego Block Party, 4th Tuesday of each month at 3:30 pm. (December block party will be 3rd Tuesday due to holidays.) Afterschool snack, Lego games, and creative building. Sign up at the library. 1st grade – 8th grade. They will resume on Jan. 25 with Friendswood by Rene Steinke, 4th Mondays at 6:30 pm. We are always seeking new people to join us! Give us a try, we have a friendly talkative bunch. It’s a great way to meet new people in town. Books in regular and large print available, as well as audiobook, at the library for checkout, stop in and get yours today. Jan. 19 Heyworth Businesses Then and Now at 6 pm in the Community Room with a short presentation on the collected histories and pictures the Heyworth History Club have gathered to date. Join us for this informative presentation, but more importantly bring items to share to broaden our collective knowledge of local business history. Do you have a ruler, baking mitt, or magnets in your possession of previous area businesses? Or pictures of area businesses? These are the items of interest we are looking to document. Give away trinkets with the business names are items we are looking to take pictures of to document this part of our local history. Heyworth History Club, “History in Your Own Backyard” Winter Series, 6 pm – 8 pm, RSVP by Jan. 18. 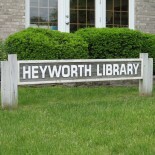 This entry was posted on December 2, 2015 by Heyworth Public Library District.